for possible inclusion in Darker Than Blue magazine. "What can I say? Every year the band seem to enjoy performing more than the last time. I don't know how many times I have seen them now, but every year there is something a little special. So what was it this year? For me it was 'Into The Fire' - , could big Ian's voice handle that? I would have to say YES, and with almost consummate ease. I would have enjoyed more tracks from Rapture Of The Deep, so would my 10 year old who loves the newer stuff (and why not?). Steve, Roger, Ian, Ian and Don all gave 125%, tight, skilled and all individual masters of their craft. The rest of the set was pretty much as the current European gigs, and yes 'The Battle Rages On' was a nice addition to the set, perhaps aligned with the current world political scales it's got a message for us all. So to sum up the night! High point..............DP walk on stage. Low point................The night had to end. Roll on NEC, if it matches this I will have a night to look forward to." Roger Glover took time off after Manchester to sign a limited edition print taken from a painting he donated to raise money for the Linda McCartney Centre based at the Royal Liverpool Hospital. There are 100 prints available, and you can find out more at www.yourcentre.org. The event was organised by Lesley Worrall. Thanks to Stephen Clare for the information. ".....It’s about this point that I’m starting to run out of superlatives for the set. “The Battle Rages On” is tight, the staccato riffing so controlled and precise with a reigned in power and majesty that fits so neatly alongside some of the “Rapture…” material it’s a real shame that there aren’t more new songs for it to rub it’s shoulders with...."
"As a 40 year old veteran of 50 purple shows during the past 22 years, Bournemouth for me has to be in the top 3 for performance. 'Thin Lizzy' were superb although I can't quite get my head around them using that Title. I have had to sit through Styx yet again and it gets more painful every time. I asked the chap sat in front of me to stand up so I could not see the stage but sadly he remained seated. My wife, who has limited knowledge of rock music summed it up when she said "That was truly awful, simply embarrassing". A gentleman to by right actually new all of the words and appeared to be enjoying it! Rather than give a detailed summary of every song I will comment on a few highlights of the concert and they are that; how great it was to hear how Powerful I.G's voice was and how relaxed and comfortable the band are with one another. New songs such as THINGS I NEVER SAID and RAPTURE OF THE DEEP were awesome ( that Mr and Mrs Styx is what Awesome really is) which then gives way to some frustration about the content of the set list during the past few tours. How I would have loved Seventh Heaven to be part of the set list. I digress. PICTURES OF HOME with some bursts of guitar work from Child in Time thrown in is a ball shaking way to open a set and by the time INTO THE FIRE is half way through it was obviously going to be a special evening. I was on my feet the whole time and sweating buckets and it was wonderful! Have I ever heard a better version of LAZY? I very much doubt it. "Just got back from the show at Wembley tonight and I have to say Purple blew me away. I've been listening to their albums for nearly 30 years but this was the frst time I've seen them and it was with a little trepidation. Can Gillan still sing? (a definite yes). 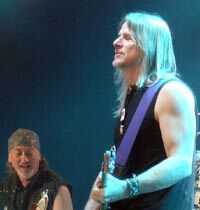 Will Steve Morse suffice when I''ve always wanted to see Blackmore playing with Purple live? (a definite yes). The setlist hit all the right buttons for me - some later songs but a healthy dash of the Mk2 songs (obviously). "When A Blind Man Cries" was a high and the opening onslaught of back to back songs was advance notice that we were in for a treat. "Lazy" and "Space Truckin" never sounded better. "Rapture Of The Deep" sounded like it had been lovingly nurtured for years as well. Of the other acts? I thought Lizzy were very good - should have had longer. Styx I saw at Wembley in the early 80's and thought were great at the time but have to say by the time they finished I was praying for them to get off. For me they outstyed their welcome but the crowd reaction seemed mixed so what do I know? I think Lizzy got everyone up for the main act, Styx acted like a shot of valium. 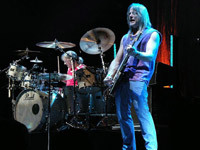 "Over all, something of a cut back power blast, presumably to make sure they saw off Thin Lizzy and Styx. Lizzy could be just as credible as a Whitesnake tribute band, given that three out of four have played with Big D. They now have the distinction of not only no original members, but no one even from their country of origin! More Brighton reviews & photos..
"This time I didn't read any of the reviews or tour set list stuff prior to the gig. I wanted to see it fresh. Opening with Pictures of Home ( one of 5 from Machine Head) made a big impact, with Paicey's drum intro thundering out, then into that groovy shuffle. 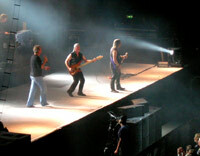 The guys were on great form; Ian Gillan in particular sounding and looking great. With two bands on prior to Purple the set, I think was a little curtailed, with some notables, Perfect Strangers and Speed King missing, but the classic were still there. Machine Head was well plundered this time around with Highway Star, Smoke On The Water, Lazy and Space Truckin' in addition to the opener. A surprise highlight was The Battle Rages On, given the background of that album and all the hassle with Ritchie and Joe Lynn Turner etc it was really good. A quick word on the support acts. Thin Lizzy on at about 7pm was a bit early, and a good few folk missed them. What a classic back catalogue they have to choose from, and they played it all really well. I did think they were a wee bit like a top notch tribute band, but they made a lot of punters happy, so why not. Styx - wow, these guys postured and pranced all night like nobody's business, a real Pomp Rock Parody (of themselves). Great players but spoiled by the stadium gig on-stage antics - thumbs down from me. "Since DP abandoned the regular gig circuit in Britain, each tour has begun to seem like the one before. A few tweaks here and there, but whatever you say or do, nothing much changes. The only way to keep track of them is by remembering the support bands. So depressing has this become to me that I simply didn't bother getting a ticket for this latest outing, determined to stop the nervous tension which gets to me before the shows. Then with 24 hours to go Tim Summers was told he'd won two tickets for the Sheffield show and decided I had to have one. Ann resisted the pressure; I buckled. Styx seemed to border on the edges of parody at times (I'm surprised they didn't ask everyone in the hall for a group hug at the end). 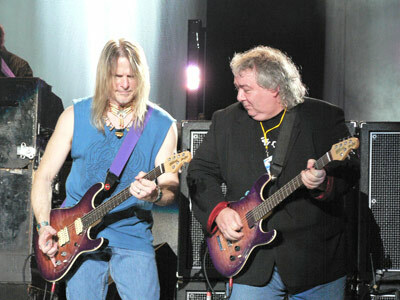 Deep Purple mercifully were more grown up; they came on and played it straight down the line. Hit after hit, riff after riff, much to the delight of four guys in front of me who could almost have been ticking them off on a check list as the tracks powered by. The sound was awful even in an ideal spot in front of the mixer. Everything was so bright and trebley, the guitar and the keyboards occupying the same space, bass quite ill defined and drums relatively quiet. Much of the time it seemed like Ian Gillan was out there on his own, doing a bang up job of just about everything he went for. It was only during The Battle Rages On that the group began to work together, although the menace inherent in the track was rather spoilt by the cheesy Harpsichord effect on the keyboards. After this the set seemed to burst into life; a trio of Space Truckin' , Highway Star and Smoke all delivered with the knock-out punch of DP at full throttle. But they sure left it late in the day. A certain amount of irony then that it was the old Machine Heads cuts which once again came over best. The crowd seemed mostly happy too, those that didn't leave after the end of Styx that is (and there were a lot), so I'm sure they can continue in this vein for a few years before it fizzles out, but next time unless they really have a proper rethink, then I'm voting with my feet. The vibe on this tour is that they feel the bill was a "mistake" (at least two of the band have apparently come out and said this)... Der; somebody booked it. It's crazy to bleat on about it being "unrealistic" to cater for the fans, and manifestly untrue. Check out the upcoming reformed Orchestral Manoeuvers In The Dark tour; five dates for the fans, playing rare album material, and ten dates for those who want all the hits. And which have been the first dates to sell out? You guessed it. "This was the first time I had seen the band for over seven years, and had only decided to go after much soul searching, as my last concert left me with a feeling of watching a tribute band that were lurching perilously close to a cabaret act. Contrary to the spin put out about the band, the shows just did not have that spark and dangerous excitement of previous tours. I have always had a soft spot for Thin Lizzy but this latest reincarnation is everything that I feared Purple was becoming – very good musicians who were living off past memories. Last night again left me with more questions than answers. The sound from where I was (in front of Morse) was loud but awfully mixed, which spoied the first 2 – 3 numbers. As the band ran through the opening 4 or so numbers the same old doubts returned. Sure Gillan is still hitting those high notes and his voice is in fine form (Into the Fire was magnificent) but it took until The Battle Rages On and into Highway Star / Space Truckin' and Smoke On The Water for the band to get out of first gear and hit the level of performance that was so special in years past. The set list was as disappointing as it was predictable. Why nothing from Abandon or House of Blue Light ? And leaving Perfect Strangers out with all its majestic pomp was bordering on lunacy. Overall an average evening – that is something I thought I would never say about a Purple show." "Have to admit coming away from The NEC feeling slightly flat last night. Having not seen Purple since the Bolin days and having read the reviews recently posted I expected to be treated to a top notch performance. Maybe because it was the last UK gig on the night and they were knackered but it felt like a going through the motions exercise, proven, I think, by the crowd reaction. Subdued until a rasping 'Smoke On THe Water' at the end, ably assisted by Bernie Marsden. There is no denying the quality of the musicianship and vocals, but no heart or inspiration. My son's reaction was that Deep Purple were the worst headlining band we have seen in the last two years. A bit extreme I think when you consider Coldplay and Kasabian are on the list, but the ignorance of youth never ceases to amaze. The reliance on overly familiar early material may also be a factor. A quick word on the supports - Lizzy appeared to have the mix wrong but got reasonable reaction. Styx however were spot on and, whilst not a particular fan, I found them to be entertaining and not particularly out of place in the line up. I have read the comments of the 'great unwashed' about the suitability or otherwise for this bill, but hey guys lighten up - they provided the bright spot of the night. It was interesting to measure the reaction of the lady next to me - on her feet for most of the Styx set, but just Smoke On The Water, Hush and Black Night for Purple, and she was a Purple fan.